Last weekend, I visited the Kopper Kettle Bistro & Chocolate Lounge in Milton. 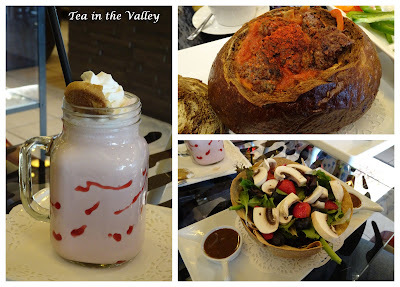 The delightful bistro was the perfect fusion of two of my favourite things: chocolate and tea! 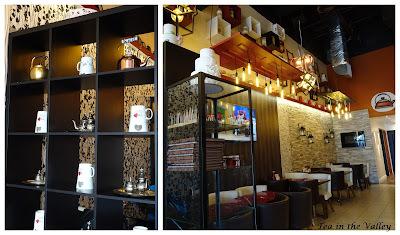 The whimsical decor made me smile. 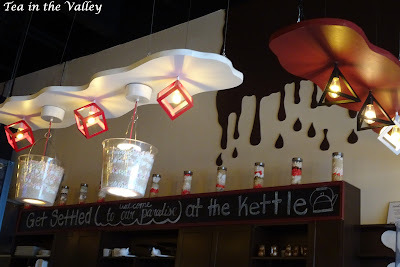 It's hard to see from the photo but the buckets hanging from the ceiling were filled with marshmallows. 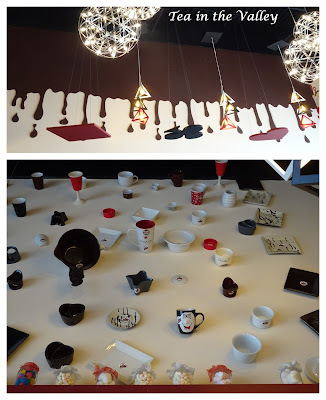 Top: one wall had "melting chocolate"; a diamond, club, heart & spade. 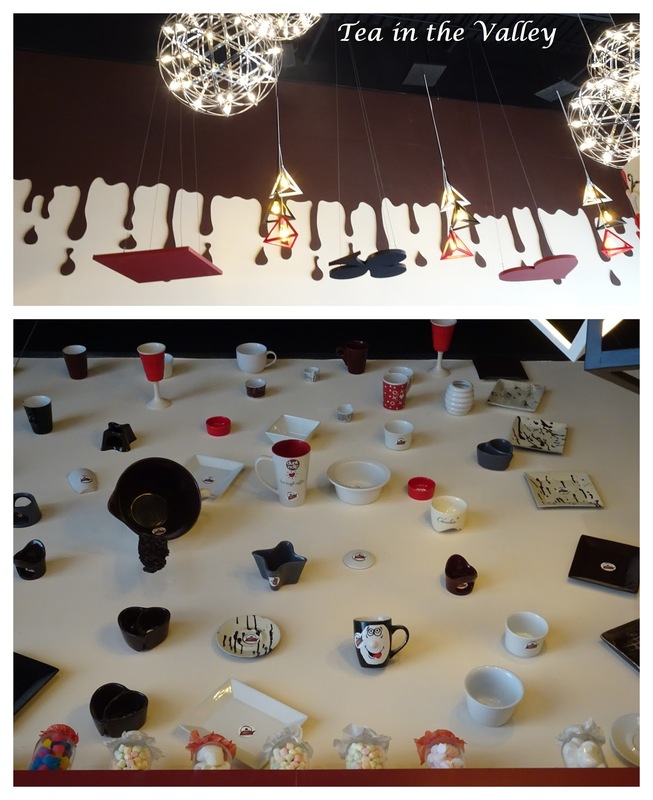 Bottom: another wall was decorated with mugs, bowls and plates. Where all the chocolate goodness is produced. 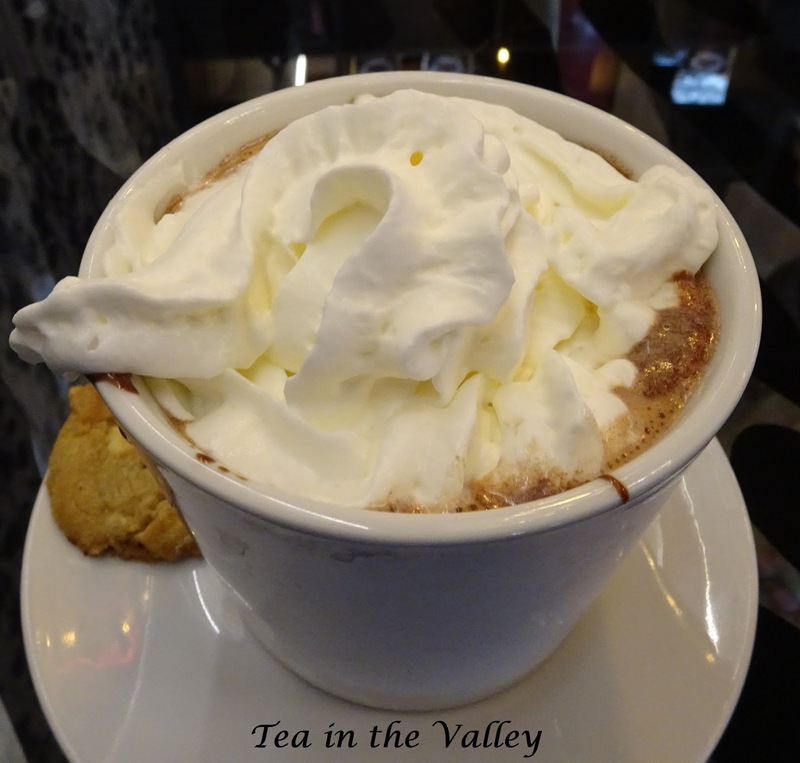 When you're in a chocolate lounge, you have to try the traditional hot chocolate! I had the "Kebab Bowl"--beef kobab served in a bread bowl (top right). My friends had a strawberry milkshake and the "Kettle Salad". 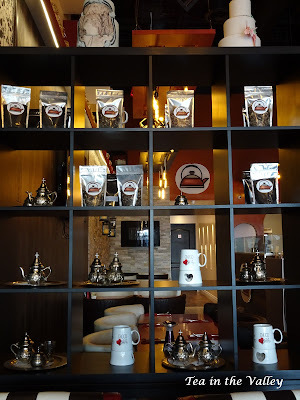 I'll definitely visit the Kopper Kettle Bisto again so that I can try their teas! Oh Margie, you visit the most delightful spots, and I'm always happy to visit through your photos. It looks like such a fun and interesting place to visit. Chocolate lounge? 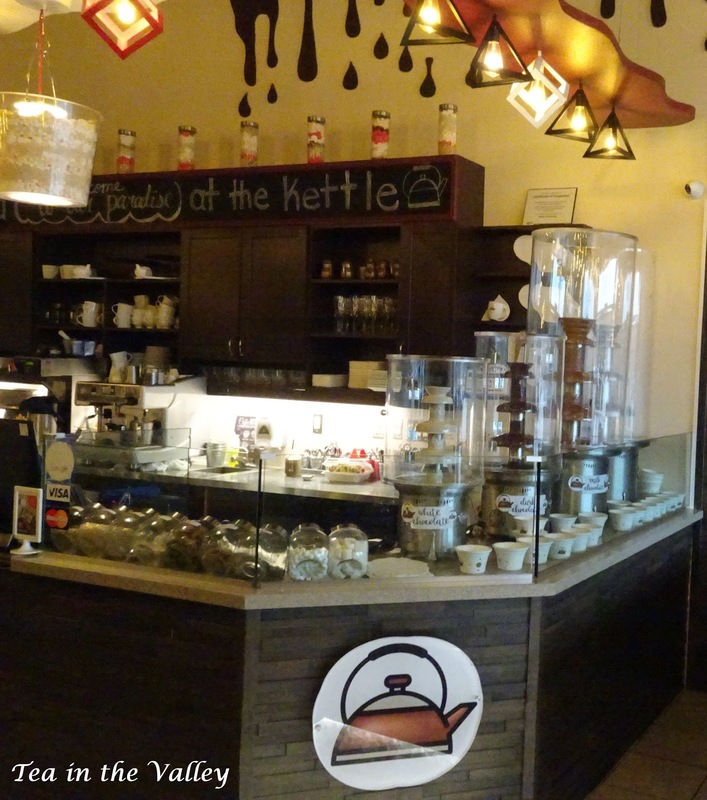 How awesome I'd be in heaven, tea and chocolate.You do go to some really delightful spots. 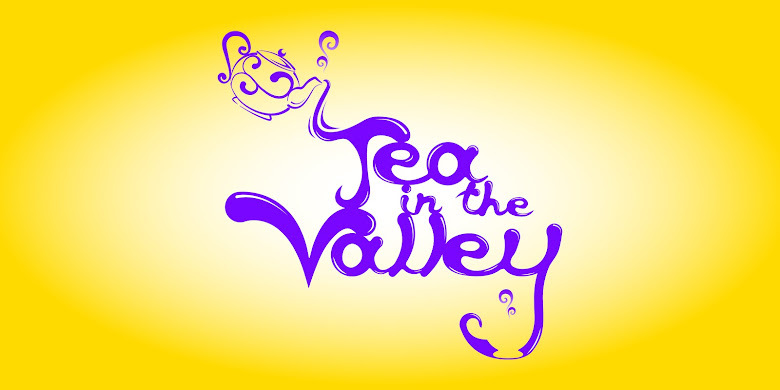 Another “tea”riffic place to visit, you find and share the neatest places. My mouth is watering for that cup of hot chocolate! Oh my, what a fun place to visit for chocolate treats! Their decor is so perfect. Even the kiddies would love it. Your kebab bowl looks good too. You must live in the best place for an adventure in tea, chocolate, and just having a meal! It's fun tagging along through your photos. You find the best places for tea (and chocolate!) I'd love a cup of that hot chocolate on these cooler mornings. Wow! What a place, Margie! I do love a good hot chocolate now and then as dessert. Thank you for your well wishes last week. Thank you for taking the time to visit and leave a comment! Hello. My name is Margie and I'm a teaholic. Text and images on this blog may not be used or distributed without permission of the author.